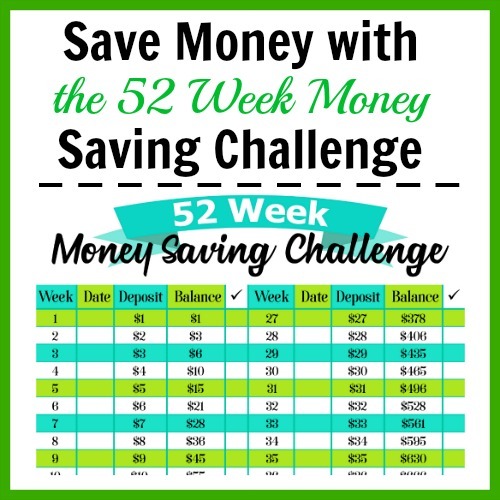 The 52 Week Money Saving Challenge + Free Printable! 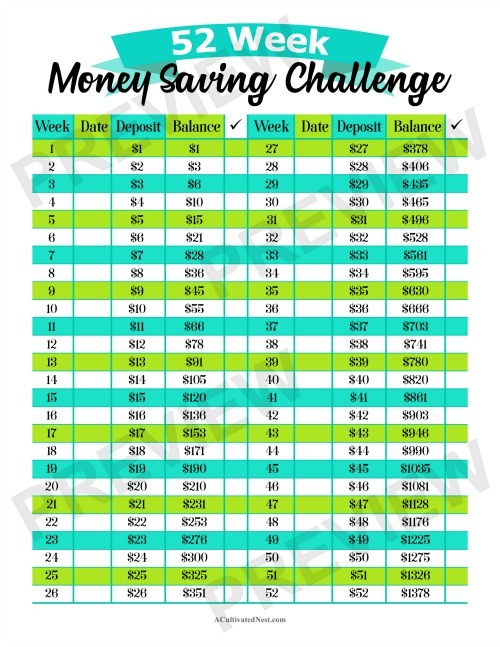 52 Week Money Challenge Free Printable. There are a lot of different ways to save money. But perhaps one of the most fun ways to approach saving is with a challenge! Challenging yourself to save more and more as the year goes on is very motivating to many people, and a great way to put aside $1,000+ in your savings/emergency fund by the end of the year. So if you’ve struggled with saving before, here’s how to Save Money with the 52 Week Money Saving Challenge! Free printable included! While this challenge is designed to be started in January, if you’re coming across this later in the year, that’s okay. Just add up the amount from the weeks you missed, put that into savings, then go ahead with the challenge as normal. That’s why the challenge starts with the smallest amounts first! I wish I could say that I invented the 52 week money saving challenge, but I didn’t. I actually don’t know who created it, but I think it started around 2012/2013, or at least that’s when it became popular online. And unlike some money saving trends, the 52 week challenge has stayed strong across the years, with newcomers and old challengers doing it every year since its creation. That’s because the challenge works! It takes away the stress of figuring out how much to save and when to set it aside, and tells you exactly what to do and when. But that doesn’t mean you have to stick strictly to the challenge’s rules. If you get paid every other week, it’s fine to combine the suggested savings for two weeks and deposit your savings twice a month instead of every week. You could even combine the savings for a whole month into one big monthly savings deposit. Whatever works for you and your budget. But if you know it’s likely you’ll spend the money on non-necessities if you have it on hand, it’d be best to put it into savings every week, just to keep it safe. There are some variations on this challenge out there. Some use higher weekly amounts, allowing you to save more throughout the year. But I think a +$1 saving system is easier if you’re new to saving, or are on a tight budget. I’ve also seen some challenges arranged in the reverse order, with the highest savings at the start of the year. But my feeling with that is that at the start of the year, people are more likely to have tight budgets as a result of the holidays, so are more likely to give up on the challenge faster. Also, it’s less encouraging to put less away as the year goes on, because the amount you’ll see in your savings will go up less and less. But those are personal preferences, because really, there’s no wrong way to save! First, I would put the money away as soon as you get paid. If you get paid on an irregular schedule or every 2 weeks, pick a day to be savings day, like every Friday. Since the savings amounts are always changing, you won’t be able to set up an automatic deposit for the challenge, you’ll have to transfer the money manually. Second, I suggest putting the savings in an actual savings account or money market account. Those types of accounts have a limit on withdrawls (6 per month). If you put the money in a checking account you can take it out without any limits, but a savings/money market account’s limits will (hopefully) make you think twice before dipping into your savings. Savings/money market accounts also tend to have better interest rates than checking accounts, so your money will grow a bit more in them. Lastly, I’d have a goal for this money. That way when the year is over, you won’t just transfer it into checking and use it on something non-essential. 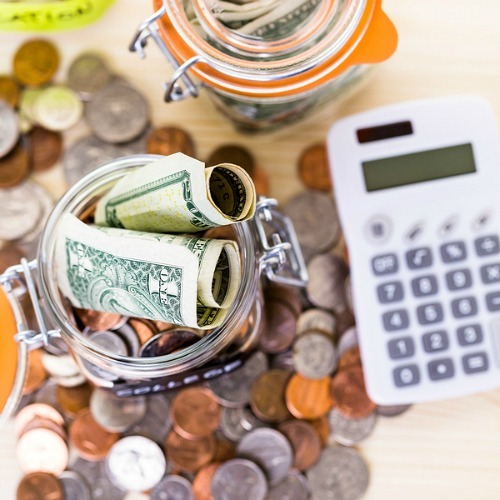 Putting it into your emergency fund is never a bad idea, or you could use it as a sinking fund for something you’ll need to buy the following year. Or just use the money to pay down debt (I have a printable worksheet for that, too!). If you complete this challenge you’ll have a little over $1,300 set aside, which is a good sum of money! Good luck! 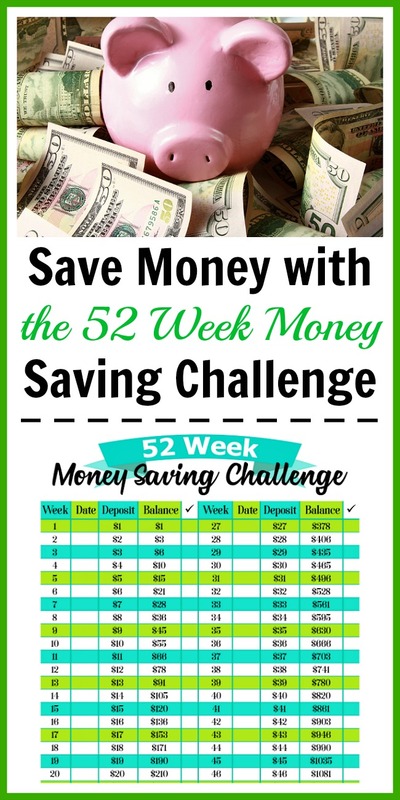 Have you ever completed the 52 week money saving challenge before?